Dylan’s Candy Bar has a diverse selection of chocolate candy and other chocolate-based wonderfulness. Shown here are the Choc-A-Lot Artisan Sea Salt Caramels, their signature Chocolate Tackle Box, and Cooke Dough Delight candies. See’s Candies have been making incredibly delicious chocolate candies for over 95 years and are one of PSC’s all time favorites. We recommend you get some now. 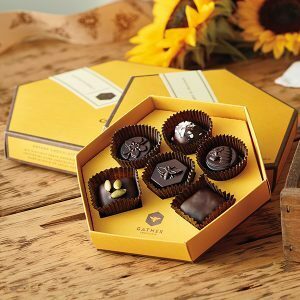 Here are three of their best-sellers: Chocolate Nuts and Chews, Toffee-ettes, and Dark Chocolate Assortment. Their Gold Box Truffles are also amazing. Matthews 1812 House has been making small batch chocolates since 1979 in Connecticut. They have a beautiful selection of chocolate candy, including these luscious dark chocolate Honeycomb Chips, best-selling Marzipan Dark Chocolates, and Milk and Dark Chocolate Toffee Assortment. You can always count on Godiva chocolates to satisfy any chocolate craving. Choose their Classic Gold Bellotin box, Dark Chocolate Candy Assortment or Special Masterpieces collection. More here. Ethel M Chocolates (of M&M Mars fame) has been making chocolates for over 100 years. Try their specialty premium copper kettle caramels, Satin Crèmes®, signature Crème Liqueurs, or classic chewy and crunchy nut clusters. Old Time Candy has the best selection of chocolate candy that you grew up with and still enjoy today. Single pack and bulk packs available. Choose your favorite old-fashioned candy by decade, or shop by flavor or type of candy. Shown here are Andes Creme de Menthe thins, Big Cherry Bar, and of course, M&M’s Peanut candies. 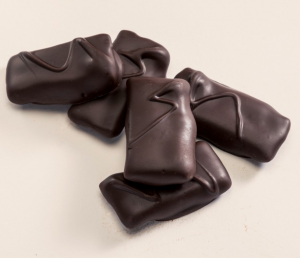 Harbor Sweets has been making chocolates by hand in Massachusetts since 1923. Their chocolate candy is amazing! Pictured here are Peanut Butter Ponies, Dark Chocolate box, and Sand Dollar candies. Harbor Sweets has nautical, beach, and horse-themed candies and gifts. The PSC staff almost always have a bag or two of Ghirardelli Chocolate Squares on hand. They’re tasty and indulgent, but not too much and go really well with that afternoon caffeine fix. Shown here are the Premium Chocolate Assortment, the Intense Dark 86 Percent Cacao, and the Milk and Caramel Squares.